One of London 2012's biggest sponsors has been heavily criticised for failing to provide cash machines which can be used by people with sight defects. The Royal National Institute of Blind People threatened legal action against Visa in July under the Equality Act, saying ATMs must have audio assistance. The RNIB withdrew the legal threat when Visa agreed to temporarily upgrade two of the machines - but the company said that while this work was never actually done, it still met all of its obligations under equality legislation. 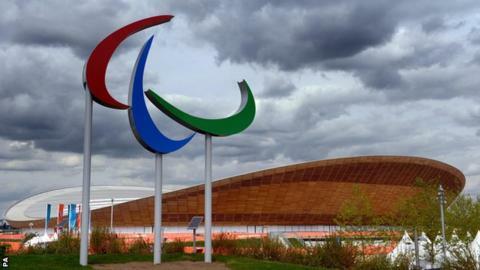 With the Paralympics under way the emergence of the dispute comes at a sensitive time with so much focus and attention on accessibility for people with disabilities and impairments. The RNIB said it worked with the London Organising Committee for the Olympic and Paralympic Games (Locog) for more than three years to ensure the cash machines in the Olympic and Paralympic Park included the latest audio technology to assist the blind and partially sighted. But while the six machines feature Braille and tactile keypads and have a socket for headphones, Visa was unable to provide the software required to make them function in time for the Olympics and Paralympics. London 2012 chair Lord Coe said: "All our ATMs have adhered to the Disability Discrimination Act, they have Braille and tactile keypads - they work." The RNIB said it reserved the right to take further action if it received any reports that blind people were experiencing difficulties in using the ATMs. Steve Winyard, RNIB's head of policy and campaigns, told the BBC he was "extremely disappointed" Visa and Locog had not been able to comply with its requests for extra assistance for blind and visually impaired athletes, officials and fans. In a statement Visa said that it undertook extensive investigations into whether the machines could be adapted in time for the Games but in the end had to accept the timeframe - just a few weeks before the start of the Olympics - was too tight to change them. The company said it was adamant it had not been in breach of the Equality Act, and had met all legal requirements in the UK. It added: "Visa is committed to addressing the needs of blind and partially sighted people in using ATMs in the UK and will work with our member banks and the RNIB to improve accessibility." Visa provides the cash machines as part of its sponsorship deal with Locog to offer card payment services at the Olympic Park and other Games venues. There was criticism a year before the Games for the controversial policy which limited ticket purchases to people with Visa cards. That controversy grew when some fans found they could not buy tickets because of their card's expiry date.